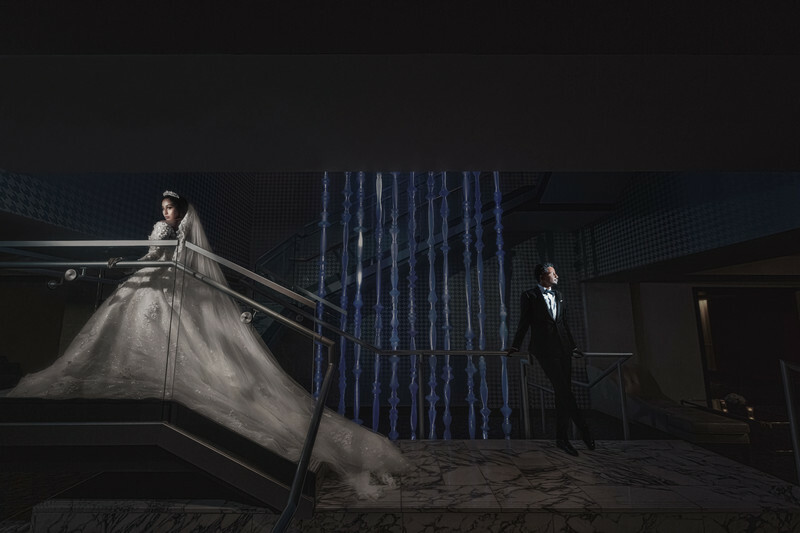 This iconic photo was taken at downtown Portland of luxury hotel the Nines for Zainab & Zak's wedding. Having had witnessed so many award winning images at the annual image competition I attend each year, I decided to push the boundaries myself. This environment was particular challenging because in order to maintain the ambient light, one has to control the light spill really carefully. My initial plan was using two flashes to light the bride and groom simultaneously. However, due to the technical difficulties of my flash equipment failure, whenever I press the trigger, one of the flashes would not fire. This presented another layer of challenge in such an environment with many reflective surfaces and walls. Given with only minutes of timeframe to create the image due to the bride and groom's schedule, I actually had to call them over to execute the shoot again from their next dancing break. Thankfully, Zainab & Zak were always so patient with me. Eventually, on the second try, we were able to conclude this portrait shoot. It was certainly one of the best photographs I have ever created in terms of the thorough planning and composition. To place the subjects on the separate ends of the frame and look at different angels in order to create leading lines, it was something I rarely do. Not to mention I absolutely love the intense eye emotions from the bride Zainab! Location: 525 SW Morrison St, Portland, OR 97204. Keywords: award-winning (3), couple portrait (6), destination wedding (6), Portland wedding (3), theNines (3).